Check out that classy label design. Looks great, right? Though I haven’t made anything close to an exhaustive effort trying out seasonal ciders this fall and winter, I did pick up this one from Tieton, partly because it’s been a long time (almost a year!) since I’ve reviewed one of theirs and I felt bad. Spice Route is clear and golden, with a light aroma that’s part clove and allspice, part dry, funky apples, and clocks in at 6.9% ABV. It was apparently launched as a seasonal offering but has been so popular Tieton moved it into their regular lineup — upon drinking it, I can understand both halves of that statement. During a time of year when everyone and their dog is releasing some variant on pumpkin spice (with or without the actual pumpkin), Tieton did a decent job of evoking similarities without keeping theirs from blending in too much. It could be the allspice, which I think doesn’t actually make it into a fair number of pumpkin/holiday spice blends. Whatever it is, Spice Route comes out with character but without smashing an overpowering mess of spices into the drinker’s face. It’s the kind of thing that would go well with holiday meals. If you’d like to try Spice Route, you can find Tieton in a number of US states, as well as British Columbia, or you can give them a call during normal business hours. Posted in Cider. 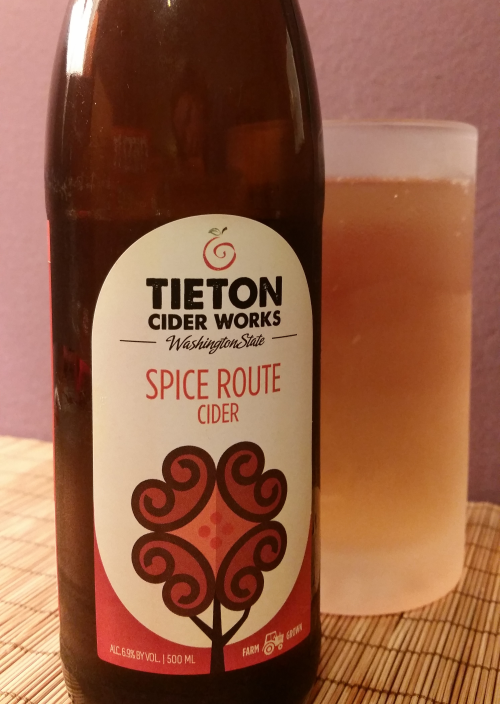 Tagged 500mL, spice route, tieton cider works.